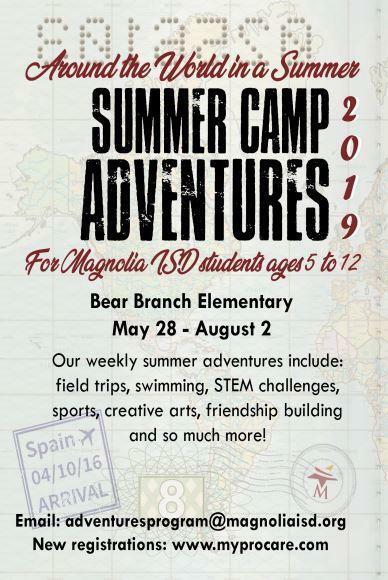 Magnolia ISD is offering weekly camps for students ages 5 - 12 during the summer months. The programs are led by MISD employees and/or teachers who are trained and attain the appropriate certifications for the programs assigned. Summer Camp runs Tuesday, May 28 through Friday, August 2. *Please Note- the start of the first day of school for Magnolia ISD is Wednesday, August 14. Drop-off 6:30 - 9:00 a.m.
Camp Activities 9:00 a.m. - 4:00 p.m. Pick-up 4:00 - 6:30 p.m.
Drop-off 6:30 - 8:30 a.m. Pick-up 4:30 - 6:30 p.m.
Enrollment occurs by-the-week, so you only register for the weeks you need. The weeks are designed by theme creating a memorable and exciting adventure!